Although a chainsaw isn’t one of the biggest purchases you’ll make, it is an important buy that requires you to do a bit of research to ensure you’re buying the most reliable machine that will last you years. Stihl has been one of the most trusted brands in power tools, and specifically chainsaws, for almost 100 years. Whether you’re looking for a chainsaw for around-the-house tasks, or you need a chainsaw for daily work, Stihl offers the type of saw you need. With so many choices even within the brand, how do you pick the perfect one? The best Stihl chainsaws are powerful, comfortable to use, reliable, and fairly priced. Stihl is a little different from other brands, though, and those quirks are part of what makes Stihl great. Read a bit more about Stihl and what your options are, and then go through the best Stihl chainsaws reviews to pick the one that’s right for you. What Types of Chainsaws Does Stihl Make? 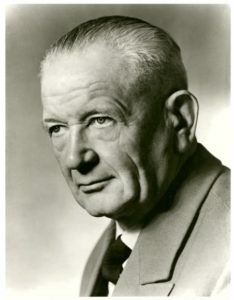 The Stihl founding father (Andreas Stihl) didn’t invent the chainsaw, but in 1926 he did improve upon it – and he patented the electric chainsaw. By 1929, Stihl had also introduced the gas-powered chainsaw, which made limbing, felling, and bucking much easier for those working in the logging and construction fields. The point of that little history lesson is to point out that Stihl has been doing this whole chainsaw thing long enough to know how to develop new and improved machines to help you with your work, whether that’s at home or on a job site. There’s a good reason why you won’t find Stihl chainsaws at popular online shopping websites or even the big-box stores. When it comes to warranties, sales, and service, Stihl likes to keep things local and personal. That’s why you can only buy a Stihl from an authorized dealer that’s in your area. Buying from local outfits means you’ll also get the best service from those authorized dealers. Stihl dealers must be knowledgeable about all the Stihl products, and therefore they can help you with whatever issue you might have with your chainsaw in the future, making this a great tool for a homeowner. 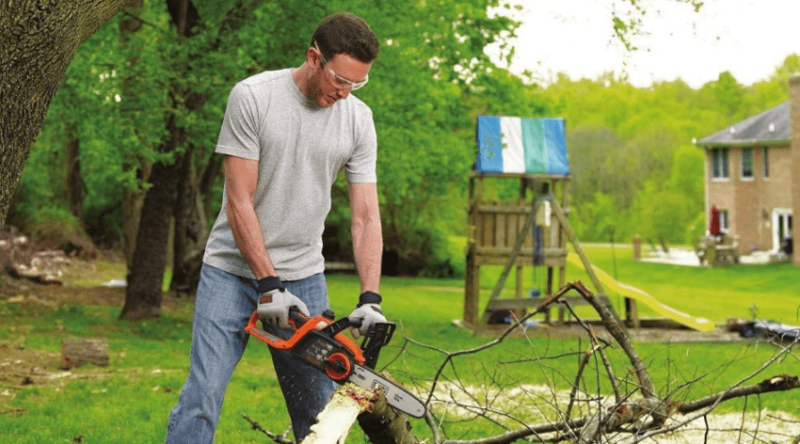 Stihl holds tight to its number one bestselling brand title for the United States, at least for gas-powered chainsaws. Many people who buy Stihl chainsaws like to brag that they’ve owned their power tool for 10, 12, 17 years, and more. 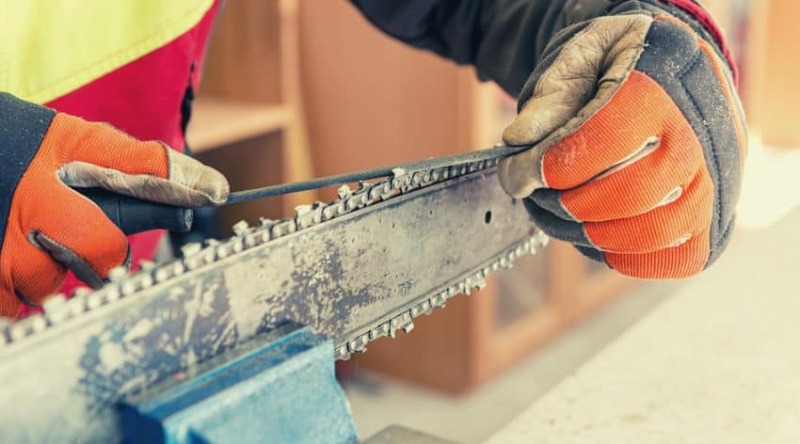 Warranties for Stihl chainsaws are typically about one year unless you’re buying as a professional for commercial use, in which case they carry a shorter warranty. The battery-powered chainsaws from Stihl are three years, which is helpful in case of a defective battery, charger, or unit. You have a lot of choices when it comes to buying a chainsaw for whatever project you have. From brands to types of chainsaws, you have your pick of the litter. If you stick within the Stihl brand name, you still have lots of choices. Stihl offers several types of chainsaws meant for specific jobs, or for all the jobs. And with so many different power sources, you can pick the one that’s eco-conscious, convenient, or simply has the most power of all them. One of the best things about a battery-powered chainsaw is the portability. The other bits that make them awesome are the no emissions and eco-friendly aspects, and they’re so quiet. They’re one of the easiest-to-use chainsaws on the market, and they’re surprisingly powerful. 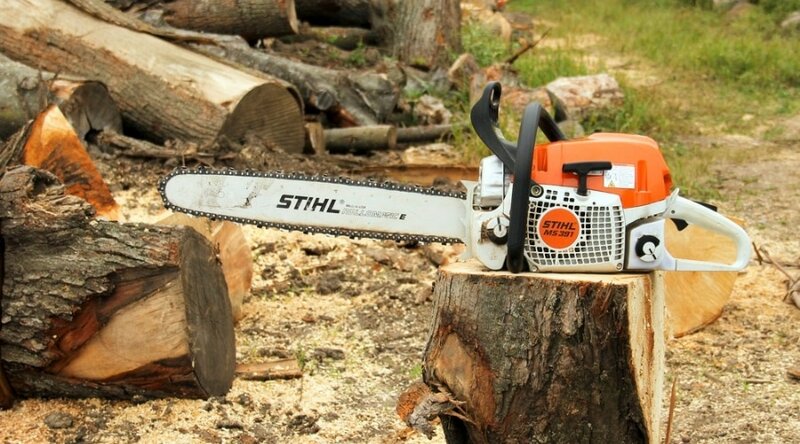 Stihl offers a variety of gas-powered chainsaws, and why wouldn’t they? It’s one of the best-selling products for Stihl. Many pros and consumers prefer the power and portability of a gas-powered tool, and Stihl makes them well, so you know you can maintain it for years to come. When you need a chainsaw for your home, but your home is a farm or ranch, you need one of these workhorse chainsaws. Stihl makes a handful of chainsaws that are meant for a variety of uses like you’d need on a ranch or farm. This is the type of chainsaw you want when you need to do pruning, storm cleanup, firewood cutting, felling, and more. 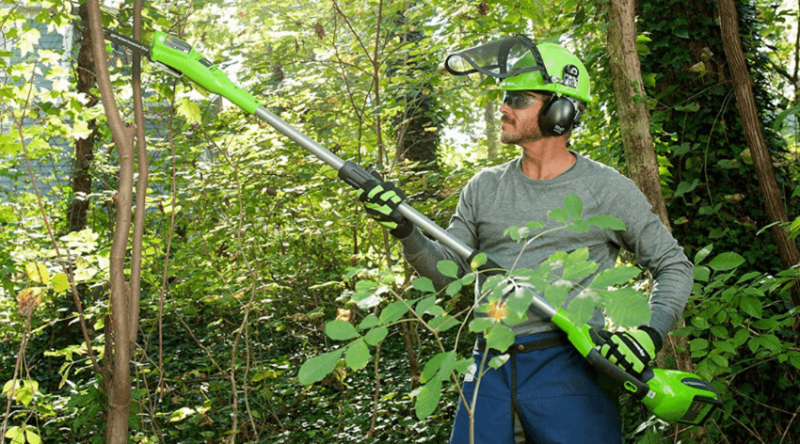 Stihl understands that not everyone needs a professional-grade chainsaw to do a few jobs around the house, and that’s why they include a category of saws meant for the homeowner. These chainsaws are mostly meant for the occasional use they get around anyone’s house. There are some lightweight options for the odd job or two, and there are some bigger, more powerful machines available for those bigger jobs. 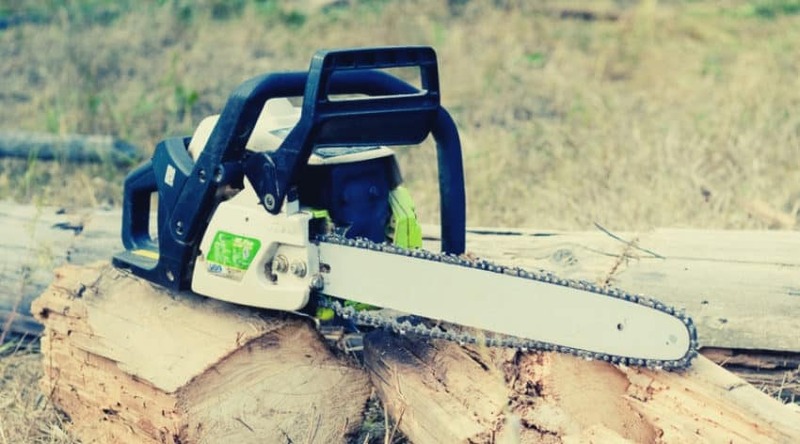 When you’re clearing land, logging, or farming as a way of life, like, it’s your job, then you need a powerful chainsaw that can keep up with you. Stihl makes several professional chainsaws for those workers. 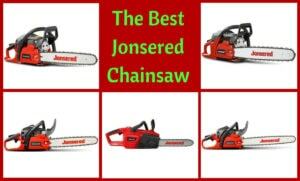 This is the category where you’ll find the most powerful chainsaws. Not all chainsaws can do the same jobs, and Stihl knows this. That’s why the company created a few in-tree saws for jobs that require you to be up on a ladder or in trees to chop limbs from tall trees. These are lightweight but still powerful. And they’re perfectly balanced, which makes one-handed work easier. When you need a chainsaw to work hard for you and keep going for extended periods, you might want to consider an electric chainsaw. There are no emissions, thanks to the electric power source. They’re still powerful, but you’ll need an outlet, which makes this a good choice for homeowners and DIYers. What is the best Stihl chainsaw in comparison to others? We’ve gathered up and reviewed the top rated ones here for you to choose from! One of the top-rated battery-powered chainsaws is the Stihl MSA 200 C-BQ. It’s a surprisingly powerful machine considering how light and small it is. You can use this chainsaw to handle pruning, limbing, chopping up firewood, and even bucking a tree or two. It’s important to remember that this chainsaw is smaller and can only handle up to a 14-inch bar. So, it isn’t meant to cut down thick hardwood trees. But for your easier jobs, this is one of the easiest-to-use chainsaws that won’t spit out harsh fumes. This chainsaw is also much quieter than its gas-powered counterparts, so you can use this in a suburban location and not worry about disturbing your neighbors too much. If you buy this as a bare tool, you’ll have to purchase a charger and battery separately, and those can be expensive. The battery should last about 45 minutes per charge, which is a decent amount of time. Put this chainsaw to work against thicker trunks, though, and you’ll likely burn through the battery charge faster. Also, the chain on this saw isn’t as durable as some others, so you may find that you have to sharpen the teeth or replace the chain often. If you need a battery-powered chainsaw that’s lightweight but still powerful, this Stihl model may be the best of the bunch. Stihl offers a gas-powered chainsaw that starts easily, has an easy to remove and replace gas and oil cap, and it’s still lightweight and powerful. The Stihl MS 251 C-BE gets excellent reviews from most consumers who have bought this chainsaw. It’s the classic gas-powered saw that’ll take a 16- to 18-inch bar. And like most newer chainsaws, this one comes with a chain-tightener that doesn’t require you to pull out a separate tool. It spits out lower emissions than chainsaws of the past, and it has reduced vibration, which means you can use this long without feeling those uncomfortable shakes that come with using power tools for hours at a time. The easy start feature works most of the time, but some people had an issue with flooding from time to time. Plus, this chainsaw guzzles the fuel down like it’s parched. It’s an expensive machine that only comes with a one-year warranty, but if you maintain it, you could use this chainsaw for years. 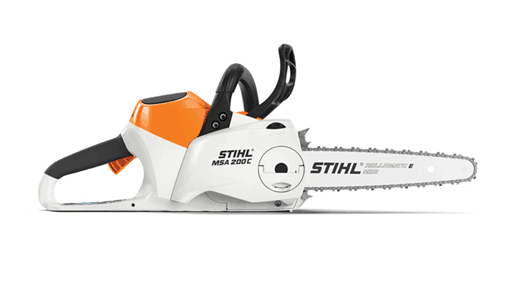 For a classic gas-powered chainsaw that should cut through two-feet thick trees, you might want to consider this Stihl machine. When you’re looking for a powerful chainsaw that can handle all the work you have on a farm or ranch, you need one that’s reliable, easy to start and a good value for the money. Many people who have bought the Stihl MS 271 Farm Boss love it for all those reasons. With a 50.2 cc engine and the ability to hold a 16- to 20-inch bar, it should be enough for all the jobs you have on your land. Plus, it has an air filtration system to help keep your chainsaw clean and running well. Not everyone was as pleased as the majority, though. Although this gas-powered chainsaw has the easy start feature that many of Stihl’s machines do, it proved to be a challenge to start for several owners. Additionally, this chainsaw is much more expensive than the big-box options out there. So, you’d think the power and warranty coverage would more than make up for that, but you only get one year of protection with the gas-powered chainsaws. If you need a robust gas-powered chainsaw for the bigger jobs on your land, this Stihl may be worth considering. Not everyone needs a professional chainsaw, but if you’re one of the few who does, Stihl offers several powerful, professional-grade chainsaws that can help you get almost any job done. The Stihl MS 461 is an upgrade from Stihl’s other powerhouses, but it consumes less gas. In fact, it could be up to 20 percent more efficient than older models. By and far, this chainsaw gets some of the best reviews from the most satisfied skilled users than other chainsaws. This gas-powered chainsaw is a bit heavy, but it needs to be what with its ability to hold up to a 32-inch bar. It’s also easier to start with its several features, such as decompression. You won’t be pulling over and over to start this machine. Its 76.5cc engine is powerful enough for most jobs. The only issues you might have are with the cost of the chainsaw, and that the chain slips a bit and needs tightening often. If you’re in the market for a professional-grade chainsaw, this Stihl gas-powered one that can hold up to a 32-inch bar might be right for you. Regardless of your power tool skill level, the Stihl MSE 170 C-BQ should be easy to use. It’s a smaller size, only capable of handling a 12- to 16-inch bar, but you wouldn’t use an electric chainsaw like this for bigger jobs. This one is meant to be used around the house (even indoors), on little projects, and for pruning and cutting up firewood. It’s a good tool to have that starts easily (with the push of a button), and it’s easy to maintain, as there’s no gas or oil required (well, oil for the chain and bar). It’s also a safe machine. It’s equipped with a chain brake to ensure that you can stop the chain immediately in an emergency. This Stihl electric chainsaw comes with a tension adjuster that’s just a knob, so you can tighten the chain easily and without the use of other tools. Yes, you can find electric chainsaws at a lower price, so that could be a strike against this Stihl. And you do need an outlet to power this machine, but that’s the case for an electric chainsaw. If you’re looking for a small, lightweight, easy to use, and eco-friendly chainsaw, this Stihl electric one might work well for you. Chainsaws come in all weights, sizes, and powers. And Stihl offers a little bit of everything from both ends of the spectrum, and a bunch in between. If you’re in the market for a chainsaw, you might be looking for something that’s lightweight and easy to use for a beginner. Or you could be looking for the most power and bang for your buck. Although all the Stihl chainsaws are great, and the ones featured here are the best of the best, there’s one chainsaw that is leaps and bounds ahead of the others. The Stihl MS 461 is one of the best Stihl chainsaws around. It has enough power to make a professional user happy, and it’s lightweight enough to use all day long. You won’t be using this chainsaw one-handed by any means, but you shouldn’t tire out early on. It has the ability to take on a 16- to 32-inch bar, which makes this a versatile machine. And it has, hands down, the most positive reviews of all the Stihl chainsaws, on average. Why Won't My Chainsaw Idle?